While designing the cantilever shaft (or any type of beam and shafts for that matter) we normally go ahead drawing the bending moment diagram to find the maximum bending moment value than creating the shear force diagram. Most of the time we ignore the maximum shear stress value for the shaft for the purpose of the shaft design calculation. Why we care (or scare) more for the maximum bending stress than the maximum shear stress value? The value of the maximum shear stress is negligible compared to the maximum bending stress value in most of the cases of shaft (or beam) design. And the maximum bending stress occurs at the extreme fiber from the neutral axis and the maximum shear stresses occur at the neutral axis. Now let’s take an example of a rectangular cross section simple cantilever beam example to understand how the maximum bending and shear stress values are coming. So, it is clear from the above example that how small is shear stress values as compared to the bending stress value in most of the cases. From the stress distribution plots above, you can observe that the maximum bending stress occurs at the extreme fiber and shear stress at the centre fiber. 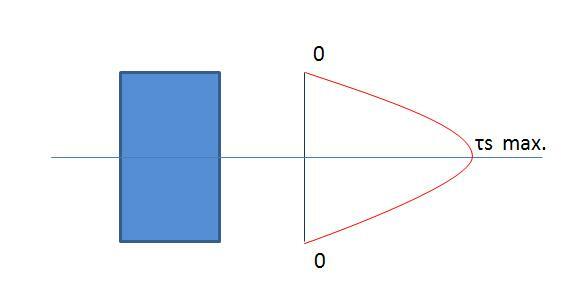 So, if you sum up the shear and bending stress at different distances from the central axis then the maximum value of the sum will appear at the extreme fiber from the center and the value of the maximum sum of the two stress will be equal to the maximum bending stress value for the beam. So, it is quite logical to ignore the maximum stress value in most of the cases of the shaft design. What is the maximum bending stress equation for i beams ? Could you do an example with , say, a 12 metre i beam with a 30KN/M running load, simply supported 2M from each end. Thanks a lot. Your answers helped me in my assignment.